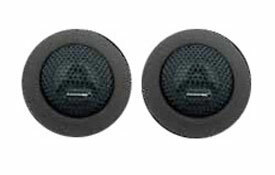 19mm Titanium Dome Tweeter Set 100 Watts RMS Per Pair. Ferro fluid Cooled and Hi-Flux neodymium magnet Flush, angle and surface mount hardware with 360? swivel function 12dB crossover with audiophile grade capacitors and polyswitch protection.